Dr. Kostas G. GKONIS is the Secretary General of INTERCARGO. The Association was established in 1980 with the objective of giving a voice to shipowners, managers and operators of dry cargo vessels and better represent this shipping sector. Its Members commit to a safe, efficient, high quality and environmentally-friendly dry cargo shipping industry. INTERCARGO is an accredited NGO observer at IMO, and a member of the Round Table of International Shipping Associations. 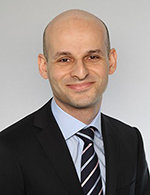 Dr. Gkonis has over 15 years of experience in industry and academia, with a background combining research with an applied market approach to the problematics of the shipping industry. He holds a PhD in Maritime Transport from the National Technical University of Athens - NTUA (Laboratory for Maritime Transport, School of Naval Architecture & Marine Engineering), an M.Sc. in International Business (Manchester School of Management, UMIST) and an M.Eng. in Mechanical Engineering with specialisation in energy (NTUA).